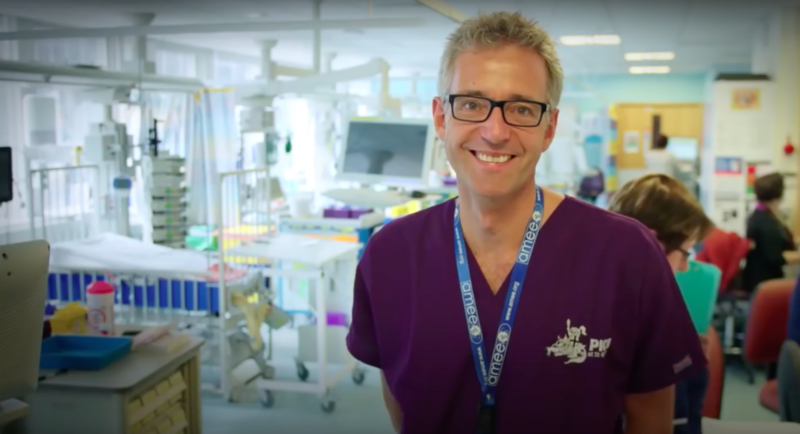 Welcome to our Paediatric Intensive Care Unit (PICU). Each family’s journey is unique, but we recognise that it can be a very stressful and emotional time for the whole family. Our primary focus must be getting your child better, but we’ll do everything we can to make things easier for you while you’re with us. If need something particular, please just ask and we’ll do our best to meet your needs. Postcode for Satnavs: SW17 0QT (Google Map) – Blackshaw Road, Tooting, London. Parking: the main carpark is accessed via Blackshaw Road. Disabled spaces are available directly outside Lanesborough Wing on the perimeter road. We have a parents’ lounge directly opposite the PICU entrance, providing sofas, toilets and a kitchen with free tea and coffee, a fridge and cooking facilities. We have a range of overnight sleeping accommodation for parents which is allocated according to needs. We have two bedrooms close to PICU, a Ronald McDonald House next to the main entrance, and overnight beds for parents on our day unit. Parents may visit at any time during their child’s stay. Other family and friends can visit up until 8pm. We do ask that bedside visitors are limited to two people per bed at any one time. The Hospital restaurant is located very close to PICU on the 1st floor of Lanesborough wing. We have M&S Food/Cafe, a Newsagents and Cash Machines at the main entrance (Grosvenor Wing) plus Peabody’s Coffee Shops (Hunter Wing & Atkinson Morley Wing) – all on the ground floor. Just a short walk away, Tooting has a large range of restaurants and a large Sainsbury’s next to Tooting Broadway underground station. Consultants usually wear purple ‘Scrubs’, our Matron Anita wears turquoise. Sisters wear red and Nurses wear blue. Registrar doctors may be in blue or green scrubs, or their own clothes. Your child’s care will be directed by the PICU team, but we work very closely with specialists from all other children’s healthcare teams. Everyone will do their best to introduce themselves, but if you’re not sure who someone is, please do ask. AM and PM shift changes occur at 7.45am/pm (Nurses) and 8.30am/pm (Doctors) – you’ll notice the unit is particularly busy at these times, especially during nurse changeover. We conduct our formal ward round between 11am – 1pm where we review the details of every child’s case and make our plans for the day. This is held in our seminar room. After the ward round, we’ll update you on any new plans. You are welcome to come and go from PICU at any time. It can be useful if you can give the bedside nurse some indication of when you might be back. We’ll always ask for your mobile phone number too. Paediatric Psychology Homepage, including relaxation exercises. Please stay in touch – it is always good to hear from families.